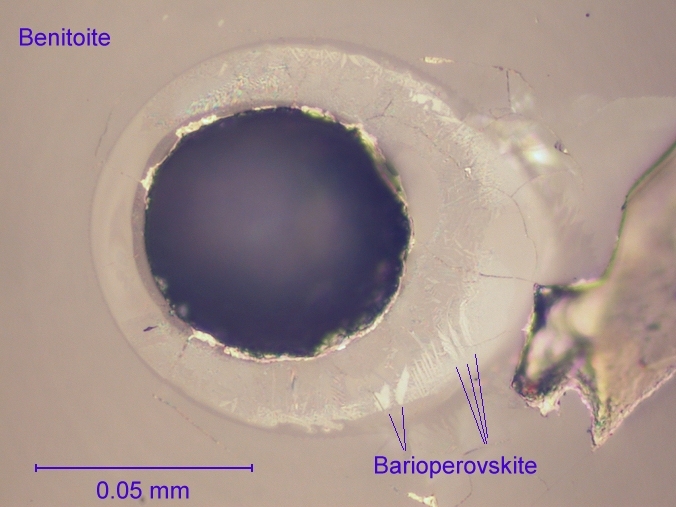 Barioperovskite, ideally BaTiO3, is a new member of the perovskite group. It is found as micro- to nano-crystals in a host of amorphous material contained within hollow, tubular inclusions in benitoite from the Benitoite Mine, San Benito County, California, U.S.A. The mean chemical composition determined by electron-microprobe analysis is (wt%) BaO 65.46, TiO2 34.57, SiO2 0.89, sum 100.92. The empirical formula calculated on the basis of 3 O is Ba0.97Ti0.98Si0.03O3. Barioperovskite is orthorhombic, Amm2; a = 3.9874 Å, b = 5.6751 Å, c = 5.6901 Å, V = 128.76 Å3, and Z = 2. The electron backscattered diffraction pattern is an excellent match to that of synthetic BaTiO3 with the Amm2 structure. 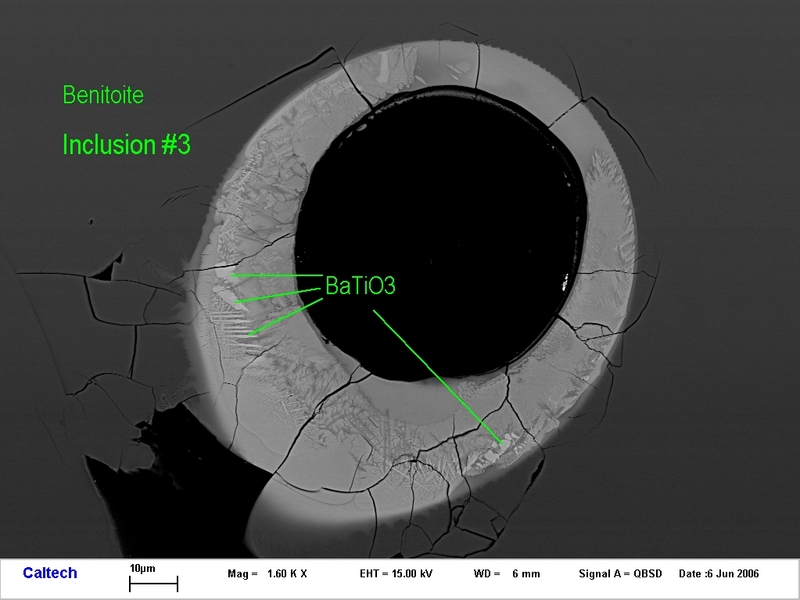 The strongest calculated X-ray powder diffraction lines from the synthetic BaTiO3 data are [d in Å, (I), hkl] 4.018 (18) (011), 2.845 (30) (002), 2.830 (100) (111), 2.316(20) (102), 2.312 (23) (120), 2.009 (28) (022), 1.640 (17) (113), 1.637 (19) (131), 1.633 (18) (202), and 1.415 (15) (222). The mineral is named after its composition, a Ba-dominant member of the perovskite group. Reflected light photomicrograph of the tubular inclusion in benitoite that contains the new mineral, barioperovskite. Backscattered electron image of the same inclusion in the SEM.